Spanish health workers say: Basta ya de recortes! Enough of the cuts! Where will SWP opposition go? Industrial action by Tube workers' unions RMT and ASLEF on the Bakerloo Line is having a huge impact, with passengers reporting delays of up to 27 minutes. Tube drivers are refusing to take trains into sidings or depots before personally performing safety checks to make sure they are clear of passengers. Last year there were over 3,000 passenger overcarries into the sidings at Queens Park station alone - far more than on any other line. These nearly resulted in the death of a 12-year old boy. 15,000 retail workers could lose their jobs, as a string of high-street chains enter administration and look set to close down. HMV, Jessops, Blockbuster, and Comet have all collapsed in the space of only two months. Since the start of the financial crisis in 2007, other major high-street retailers, including Woolworths and JJB Sports, have gone under. January marks the anniversaries of the deaths of three giants of revolutionary socialism — Liebknecht, Luxemburg, and Lenin. The Spanish government has been using the economic crisis as an excuse to make healthcare profitable. 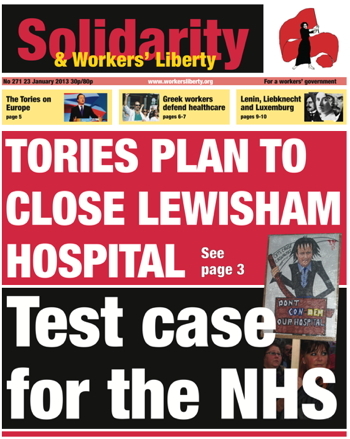 Against the cuts and privatisation, healthcare workers and communities have been fighting back. In December a two day strike in Madrid against the privatisation of healthcare saw most hospital services in the capital city closed. 3,000 protestors held hands and surrounded one of the main hospitals, La Princesa, opposing the proposals to turn 6 public hospitals, 27 public healthcare centres and 269 public health assistance centres into business companies. With 1.5 million unemployed and 30% of the population uninsured, with slashed wages and pensions not being enough to cover basic needs like food and heating, the need for healthcare in Greece has grown. Published data for the last two years is shocking: the use of drugs associated with cardiovascular problems has risen by 36%. One in six people have psychiatric problems; anti-depressant use increased by 40%, anti-psychotics by 32%. The government is doing nothing to meet this increased need — quite the opposite. It’s looking like it’ll be a challenge for us to meet our £15,000 target by May Day. Donations have slowed recently — in the last two weeks we’ve raised just £210. Asking our members and supporters – predominantly working-class people without much spare cash – for extra donations is always tough, particularly in the current climate. The American writer Ralph Emerson once said of an acquaintance that “the louder he talked of his honesty, the faster we counted our spoons”. I have the same instinct when I hear conservative commentators pontificate on human rights. Writing on the Huffington Post site on 16 January, Mike Judge (Head of Communications at the Christian Institute), claimed that while Christians are “free to wear a cross at work, they are not necessarily free to believe in marriage”. While reports of Hugo Chávez’s death may be exaggerated, there is little doubt that his prolonged treatment in Cuba is giving rise to a crisis, in which the Venezuelan workers are likely to lose out. Chávez went to Cuba for cancer treatment on 11 December, the fourth time he has been for treatment in less than two years. He has not been seen in public since and missed his swearing in as president on 10 January.